Yoga Nidra is a type of guided meditation that allows us to remain aware while we enter the dream and sleep states of consciousness. This may sound tricky but the technique is actually very practical and accessible to all. Because we lie in a comfortable position (also known as the yoga pose savasana) for the duration of the practice of yoga nidra rather than participating in the other more technical and physically demanding yoga poses, people of all ages, fitness levels and health statuses can participate. Decreases stress and anxiety, decreases symptoms of PTSD, chronic pain and chemical dependency. Increases feelings of peace, calm and clarity, increases awareness and focus. Transforms negative habits, behaviors and ways of thinking. There are several components of a full yoga nidra meditation. While this week’s classes will still be hot vinyasa yoga, I will incorporate one or two components of yoga nidra. Our nervous systems will be grateful! Can Side Crow Come Out To Play? Do you remember when going out to play was a huge part of your day? I know among adults play is sometimes considered unproductive and a waste of time. I disagree. The more relaxed I am, the more productive I am. Ideas and solutions to problems almost effortlessly spring to mind when I am open, having fun and feeling free. And what better way to find a relaxed state of mind and body than by playing? 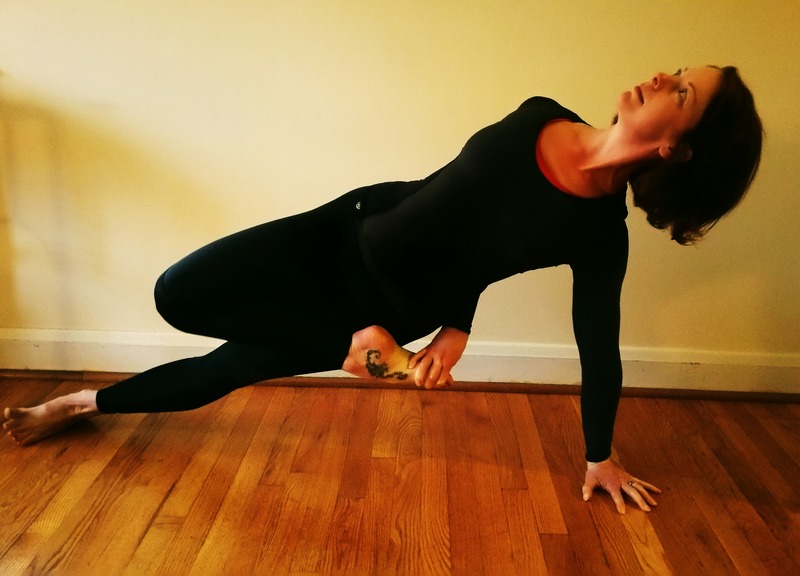 How does play fit into my yoga practice? Very prominently! The Sanskrit word lila can be loosely translated as play. One use of this term refers to the notion that the universe was born through playful creativity, freedom and bliss rather than necessity. Whoa! If an entire universe can be created by having fun, what will happen if we try some playful variations of side crow during my classes this week? The possibilities are limitless! Show up this Friday from 2-3pm at Towson Yoga Works if you want to have some fun! These words by Liz Huntly are a perfect description of this (and most!) week’s yoga classes. Join me this Friday from 2-3pm at Towson Yoga Works to find balance among all of the imbalances that are an essential part of being human. ®Copyright Heather Fulkoski-Johnstone, L.Ac, M.Ac. All rights reserved.